redsn0w is a multi-platform jailbreak and unlock tool created by the iPhone Dev Team. 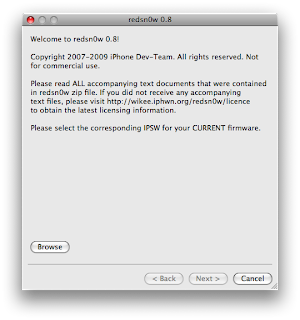 redsn0w is very easy to use, and it supports all of the current iPhone and iPod Touch devices running on firmware 4.3.1. [UPDATE: 12/2010] You can download the current redsn0w software from any of the following links below. Be sure to download iUserbar new for jailbreak/iPhone updates..
redsn0w 0.9.6rc16 Windows Download (Windows users must run redsn0w as Administrator under "XP Compatibility Mode") and also click here to download iUserbar for important iPhone/jailbreak updates. redsn0w 0.9.6rc16 Mac Download and also click here to download iUserbar for important iPhone/jailbreak updates. redsn0w 0.9.6rc9 Linux Download (not out) and also click here to download iUserbar for important iPhone/jailbreak updates. Disclaimer: We are not responsible for anything that happens to your device as a result of using this software. Jailbreaking your device voids your warranty. Not sure how to use redsn0w? Click on the link below for a tutorial.